Chosen passion-bearer of Christ and gracious healer, who freely grants healing to the sick, we praise you in songs as our protector. 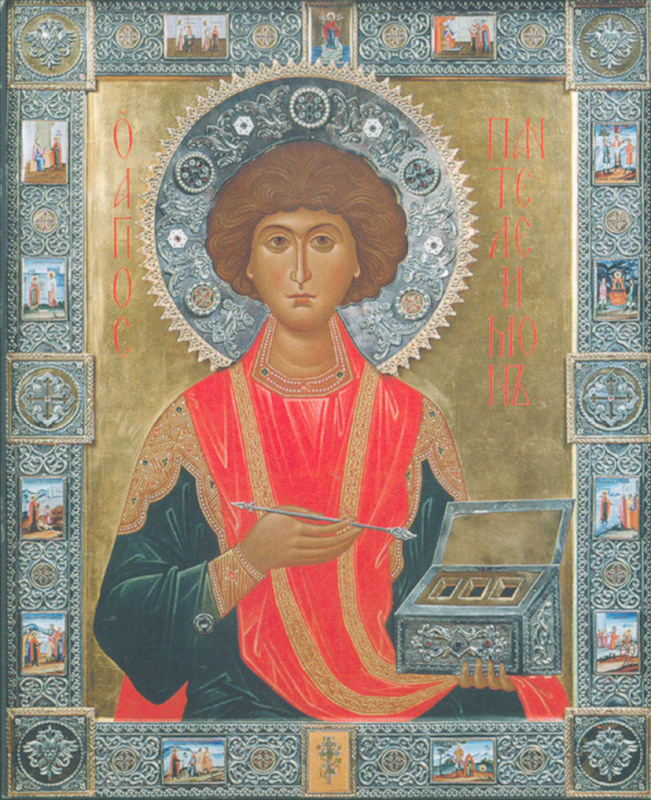 As you have boldness with the Lord, free us from all harm and sickness who cry with love to you: Rejoice, Great Martyr and Healer Panteleimon! Rejoice, most glorious lamp of the Church! Rejoice, adornment of venerable martyrs! Rejoice, support of the faithful in fearless endurance! Rejoice, outstanding boast of youth! Rejoice, warrior of Christ of invincible courage! Rejoice, you who having grown up in the world were not of the world! Rejoice, angel in the flesh, surpassing mortals! Rejoice, all-blessed dweller in Heaven! Rejoice, vessel of divine knowledge! Rejoice, you by whom faith has been exalted! Rejoice, you by whom delusion has been dethroned! 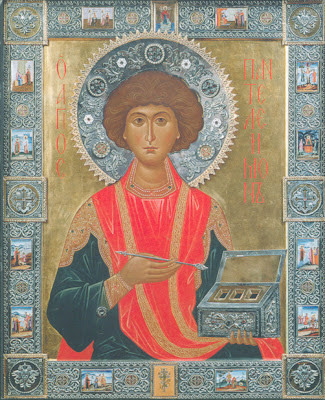 Rejoice, Great Martyr and Healer Panteleimon! 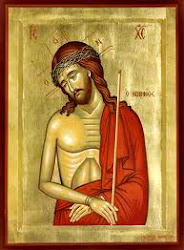 Seeing you to be a chosen vessel, the Lord loved the beauty of your soul; for, despising all earthly glory and pleasure, you longed to adorn yourself with the crown of martyrdom, wounded with divine love and singing inspiringly: Alleluia! Rejoice, you who despised Maximian’s threats! Rejoice, you who did not yield to the advice of the godless! Rejoice, propagator of true adoration! Rejoice, uprooter of demon worship! Rejoice, accuser of the fury of the torturers! Rejoice, overthrower of the delusion of idols! Rejoice, you who dispersed the assembly of the godless! Rejoice, you who exchanged corruptible for heavenly joy! Rejoice, converser with immaterial angels! Rejoice, fellow-chorister of long-suffering saints! Rejoice, you by whom Satan was put to shame! Rejoice, you by whom Christ is glorified! By the power of the Most High given to you and by your strong patience you rendered powerless the torturer’s insolence, O valiant victor, undaunted by fire, wild beasts, and the wheel. When beheaded with the sword, you received the crown of victory from Christ the Lord, crying to Him: Alleluia! Rejoice, all-radiant lamp of Nicomedia! Rejoice, unsleeping guardian of the monastery that honors you! Rejoice, you through whom godlessness grew cold! Rejoice, you through whom the knowledge of God has increased! Rejoice, bright glory of passion-bearers! Rejoice, joyous report of the Orthodox! Rejoice, gracious source of healings! Rejoice, container of great gifts! Rejoice, fragrant myrrh that sweetens souls! Rejoice, for you help those who call upon you! Rejoice, you who gave sight to the blind! Rejoice, you who caused the lame to walk! Possessed by a storm of polytheistic thoughts, the impious Emperor was confused on learning from the doctors who were jealous of you that you heal all kinds of incurable illnesses by the name of Christ. And we, glorifying with gladness our wonderful God in you, cry to Him: Alleluia! Rejoice, you who are anointed with the myrrh of Grace! Rejoice, sanctified temple of God! Rejoice, great glory of the pious! Rejoice, firm wall of the oppressed! Rejoice, you who surpass the wise in knowledge! Rejoice, you who enlighten the thoughts of the faithful! Rejoice, recipient of divine gifts and source of many of the Lord’s mercies to us! Rejoice, speedy helper of the suffering! Rejoice, harbor of the storm-tossed! Rejoice, instructor for those astray! Rejoice, you who heal the sick freely! Rejoice, you who impart healing abundantly! The Lord worked a glorious miracle through you when, through His servant Hermolaos, He called you into His marvelous light. For after your prayer to Christ a child who had died from snakebite at once revived and stood up healed. Then recognizing the Lifegiver as the true God of all, with firm faith you cried to Him: Alleluia! Rejoice, you who have great devotion to God! Rejoice, you who are ever aflame with the fire of divine love! Rejoice, attentive listener to the teachings of the priest Hermolaos! Rejoice, you who followed the advice of your mother Eubule! Rejoice, you who gave away everything to obtain Christ! Rejoice, you who vanquished love for the world by love for God! Rejoice, for instead of the pleasures of the world you accepted for Christ cruel sufferings! Rejoice, for you became a partner of Christ’s Passion! Rejoice, you who overcame all the passions! Rejoice, you who through Grace were adorned with dispassion! Rejoice, you who fill with joy those who hasten to you! Rejoice, you who heal all freely by the Grace of Christ! The blind man enlightened by you in body and soul became a preacher of the truth for, like the blind man of the Gospel, he boldly preached Christ to all as the true light that enlightens every man. But for reproaching the impious Emperor and the pagan gods he was beheaded and rose to the unwaning light in Heaven to sing to God: Alleluia! Rejoice, thundering mouth of the deity of Christ! Rejoice, melodious tongue that declares His plan of salvation! Rejoice, orator of sublime theology! Rejoice, wise sower of piety! Rejoice, sweet-sounding flute of faith! Rejoice, glorious preacher of Orthodoxy! Rejoice, you who were shown to be marvelous before your death! Rejoice, worker of wonders after your death! Rejoice, seer of Christ’s glory! Rejoice, listener of those who pray to you! Rejoice, giver of help to those who need it! Rejoice, obtainer of blessings for those who honor your memory! Myrrh was poured out on your soul, O divinely wise healer, from the Comforter Spirit, therefore after your death your venerable relics, by their fragrance banish the stench of passions and give healing to those who with faith cry to God: Alleluia! Rejoice, you who despised earthly pleasures! Rejoice, you who were above material comforts! Rejoice, for you regarded as nothing all the beautiful things in this world! Rejoice, for you shook yourself free of fleeting glory! Rejoice, you who remained free from the nets of the devil! Rejoice, you who vanquished the wiles of the torturers! Rejoice, you who did not spare your life for Christ! Rejoice, you who were shown to be an enemy of hostile flesh! Rejoice, you who oppressed the spread of polytheism! Rejoice, you who by the power of God defeated the idols! Rejoice, sharp arrow by which enemies are wounded! Rejoice, mediator who defends the faithful! The Lord appeared to you in a wonderful way, encouraging and upholding you in the tortures for His name. For in the person of the priest Hermolaos He cooled the boiling lead into which you were thrown, and in the sea He untied the great stone from your neck and brought you unharmed to land. But you, having been brought again before the Emperor, sang triumphantly to Christ our God: Alleluia! Rejoice, you who are filled with divine wisdom! Rejoice, discerner of God’s providence! Rejoice, delight of minds made wise by God! Rejoice, gladness of souls who love God! Rejoice, bright pearl of Christ! Rejoice, you who were sanctified in soul and body! Rejoice, dweller in the courts of the firstborn in Heaven! Rejoice, inhabitant of the ever-blessed bridal halls! Rejoice, beholder of the light of the Trinity! Rejoice, fervent mediator in your prayers to God for us! Rejoice, you who grant illumination to souls! Rejoice, you who send comfort to the afflicted! All nature marveled, O Panteleimon, at the radiance of Grace and wealth of virtues in you: thine angelic purity, your great courage in cruel sufferings, your strong love for Christ and great compassion for people, for whom you do glorious things that they may sing: Alleluia! Rejoice, joyful sight of angels! Rejoice, reverent wonder of men! Rejoice, you who shed your blood for Christ, and in death shed milk! Rejoice, you who gave up your body to a martyr’s death for His sake! Rejoice, valiant warrior of the King of kings! Rejoice, you who conquered the ruler of darkness! Rejoice, you who by your victory gladdened Heaven and earth! Rejoice, blessed inhabitant of the world above! Rejoice, wise pilgrim of the world below! Rejoice, tree adorned with the fruits of the gifts of Grace! Rejoice, you who carry palms of victory! Filled with compassion, as a true imitator of the Lord, the Giver of mercy, O venerable martyr, you were renamed by Him Panteleimon (that is, all-merciful), for you pour mercy on all who resort to you; pour it also abundantly on us who cry to God concerning you: Alleluia! Rejoice, precious chosen one of Christ! Rejoice, unblemished fragrance of God! Rejoice, firm diamond of the Church! Rejoice, unshakable tower reaching to Heaven! Rejoice, tamer of visible beasts! Rejoice, crusher of invisible dragons! Rejoice, you who were stained with your blood shed for Christ, mixed with milk! Rejoice, you who have received unfading crowns! Rejoice, you who cause joy to angels and men! Rejoice, you who have been glorified by God in Heaven and on earth! Rejoice, celestial one, who sings in choir with the martyrs! Rejoice, you who are satisfied with the sweet vision of Christ! A funeral song we offer to your sacred sacrifice for Christ, in which milk instead of blood flowed from you, Great Martyr, and the olive tree under which you were beheaded was all covered with healing fruit. Therefore we cry fervently to Christ Who wonderfully glorifies those who glorify Him: Alleluia! Rejoice, bright star, shining in the noetical firmament! Rejoice, ray of light shining for Christian people! Rejoice, you who were mystically illumined by the Sun, Christ! Rejoice, you who in spirit roam the earth! Rejoice, beautiful tabernacle of the Most Holy Spirit! Rejoice, honorable vessel that pours out healing! Rejoice, heir of the Heavenly Kingdom! Rejoice, partaker of eternal glory! Rejoice, patron of those in distress on the sea of life! Rejoice, unmercenary healer who helps those who invoke you with faith! You received an abundance of Grace, thrice-blessed one, according to the greatness of your love for Christ God, Who also showed you to be a source of healing, for you cure free of charge the sicknesses of soul and body of those who come to you with faith and cry to God: Alleluia! Rejoice, sweet-sounding trumpet of piety! Rejoice, sword which cuts down impiety! Rejoice, you who were scraped on a tree for Him Who stretched out His arms on the tree of the Cross! Rejoice, for, being burnt for Him, you extinguished the furnace of delusion! Rejoice, you who wounded the enemies by your wounds! Rejoice, you who dried the streams of idolatrous blood by your blood! Rejoice, you who were thrown into boiling lead for Christ! Rejoice, you who were sunk in the sea for His name! Rejoice, you who remained unharmed therein by the providence of God! Rejoice, you who passed through tortures of fire and water into the peace of Heaven! Rejoice, you who poured unfailing streams of mercy on the faithful! Rejoice, gracious and compassionate physician who grants healing through Grace! Rejoice, support of the faithful in unflinching endurance! who are here present, and of all Orthodox Christians who seek thy help. For behold, we, who because of our sins are possessed by bitter ills and have no help or consolation, yet flee to thee for refuge, since thou hast been given Grace to pray for us and to heal every ill and every disease. Grant, therefore, to all of us, by thy holy prayers, health and strength of soul and body, a good growth in the Faith and in devotion, and all that is needful unto this temporal life and unto our salvation: So that, having been granted great and rich mercy thorugh thee, we may glorify thee and Him that bestoweth all good things, our God Who is wondrous in His Saints, the Father, and the Son, and the Holy Spirit. Amen. Αναρτήθηκε από amphilochios στις 9:23 μ.μ.